This was painted as a commission and shows all the aircraft types flown by 120 Squadron, which turned 100 this year - 2018. Also in this year, the Squadron will re-form flying the P8-A aircraft in the maritime patrol role, so it's a big year for 120 Squadron! The aircraft types shown here (working from the back and left to right) are the DH-9 biplane which is the only aircraft here not used for maritime patrol. The Squadron recieved them too late to play an active part in WW1 and it was used for general duties. The Liberator was the first aircraft to cover the whole of the Atlantic Ocean during the Squadron's battle with the U-boats in WW2. It was replaced by the Lancaster GR3. The Shackleton was fitted with contra-rotating propellors and served the UK for a long time in the maritime role. 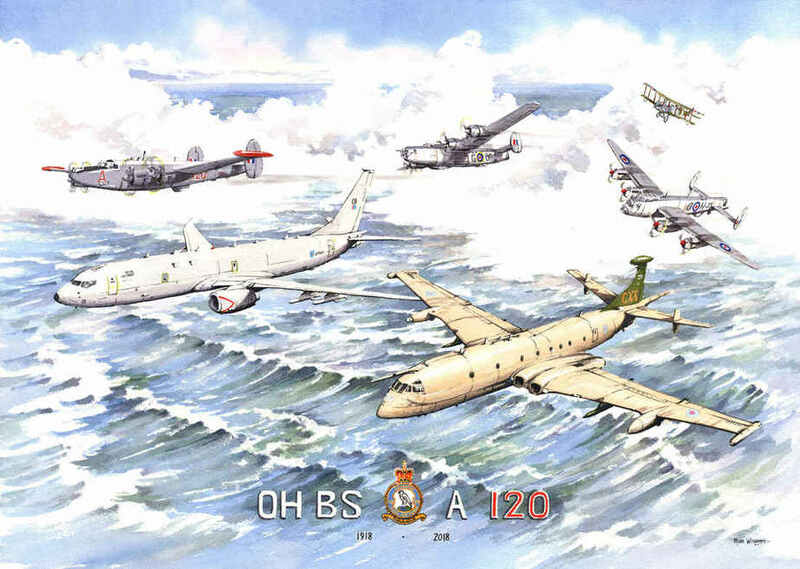 The grey aircraft leading is the new P8-A in the aircraft's British colours and the one at bottom right is the Nimrod MR2. The Nimrod again served the UK for many years until her retirement in 2010; I was privileged to fly the aircraft myself for many years during my time in the RAF. The original was sold by commission and was then generously auctioned for charity - it raised around £800! A limited edition run of 120 prints is available, 37 x 24 cm. £32 unmounted or £39 mounted, ready to fit a 20 x 16" frame.